Heavy rain and flooding caused chaos across the north-east today as rail services, roads and schools fell victim to an unseasonable downpour. Forecasters predicted up to 50mm of rain would fall in the region in 24 hours, with at least a further 25mm anticipated in higher ground. But by mid-morning, flood levels had reached over three feet in some areas, prompting disaster for commuters and road users. Workers were forced to close-off a stretch of the A90 near Stonehaven during the morning rush hour after a large pothole caused major tailbacks in the area. Motorists reported the hole had filled with rain water and caused a number of punctures throughout the morning due to poor visibility. Across the north, rail operators closed major transport routes due to flooding on the track between Elgin and Forres and high winds across the network. The early morning disruption meant those travelling between Aberdeen and Inverness were forced to arrange alternative transport after Scotrail struggled to scramble together replacement buses in time. Services between Aberdeen and stations across the north-east were also cancelled, with routes to-and-from the central belt suffering serious delays. Meanwhile, schools across the north-east were forced to close their doors as Fordyce, Ordiquhill, Portsoy and Whitehills schools all turned away pupils and staff. Inverurie Academy was also forced to heavily alter travel plans due localised flooding and Gordon Schools in Huntly had to cancel transport for pupils in Corse, Drumblade and Marnoch. High winds in Aberdeen also brought down a tree in Ashgrove Road and in Stonehaven ,a path next to the River Carron was blocked by fallen topiary. 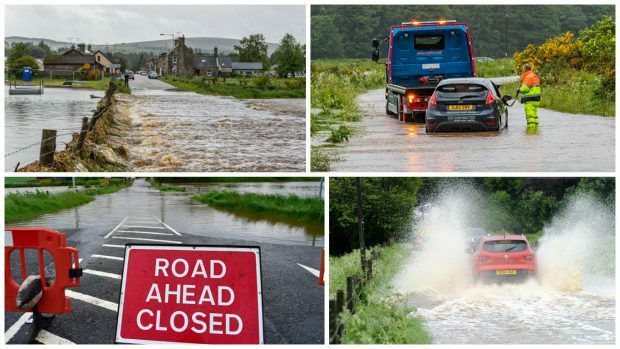 Aberdeenshire Council said their incident team had been working overnight to tackle high water levels across northern Aberdeenshire and was continuing to monitor the situation. Forecasters expect tomorrow to bring more seasonable weather to the north but warn that temperatures could continue to drop.